Google Daydream for CLAZER for $79 ! Looks comfy and it doesn’t have a cheap fresnel lens ! Works with CLAZER ! Available for only $79 next month ! Exclamation points ! 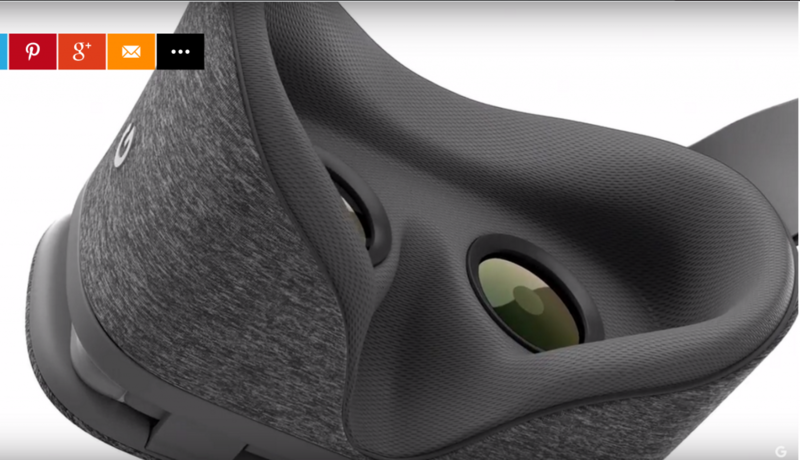 At a splashy event Tuesday, Google unveiled its new virtual reality headset, the Daydream View. And it’s plush: The goggles, which come with a controller, are covered in fabric. Clay Bavor, head of Google’s VR efforts, said the company worked with clothing makers to get the right design for the device. The Daydream View works over glasses and has no wires. Users can drop their Google Pixel phone, also announced Tuesday, or another Daydream-ready device from other handset partners into the goggles to power it. The goal for Bavor’s team: Make that technology simpler and friendlier. Daydream View marks a departure from Google’s focus on creating an inexpensive — but unpolished — experience in virtual reality. The mission for the $15 Google Cardboard was to open VR to a broad group of consumers. That perspective stood in contrast to efforts by rivals such as Facebook’s Oculus unit, which charges several hundred dollars for its Rift system, and HTC and Valve, whose Vive system is even more expensive. Samsung, meanwhile, charges $100 for its Gear VR, which is essentially a nicer plastic headset that also houses a phone for a VR experience. See a shotgun in there ? Daydream View and its controller will be available for $79 in November. The system will take advantage of Daydream, the hardware and software platform that Google unveiled at its developer conference in May. The platform and headset are designed to provide a vision for the industry and a road map for any hardware maker looking to build a VR system using Google’s Android software. It’s a far cry from the foldable cardboard products first released in 2014. The Daydream View is “really easy to use,” Bavor said. It has a clickable touchpad at the top, and “hidden inside are a bunch of sensors that respond to how you move.” As with Samsung’s Gear VR, there are no cords attached to the Daydream View. When you’re not using the device, you can store the included controller in the same part of the headset that holds your phone. At its November launch, the Daydream View will come in “slate,” a shade of gray. Later this year, “snow” (cream) and “crimson” (red) will become available. Daydream appears to be more open than other VR efforts. Samsung’s Gear VR headset, for instance, requires a recent Samsung phone to work instead of being compatible with any Android device. Bavor said “a lot” of Daydream-ready phones are coming from Google’s hardware partners.